So what is your perspective on this year in politics nationally and in Queensland? We welcome you to add your comments at the end of this page. The political year has been characterised by many commentators as a grisly one, full of aggressive personal abuse and character assassination. A prime example was the vituperative final week of parliamentary sitting – the opposition demanded the prime minister’s resignation and Julia Gillard responded by saying Tony Abbott was unfit to govern. It was the culmination of a parliamentary year appropriately described by journalist Dennis Shanahan as one of “toxicity, smear, sleaze, personal abuse, character assassination, brinkmanship, moments of dire peril for the minority government, a leadership challenge, [and] the passage of some momentous legislation”. He then goes on to conclude that for the government and the opposition and their leaders nothing much has changed because they have “finished the year where they began”. While I agree with Shanahan’s take on the year, I question his conclusion. I prefer the analysis that sat on the very same page of The Australian by Paul Kelly. Four things stand out to me about the political year that’s been. First, the reputation of politics and political leaders has justifiably fallen to a very low level. Politics is on the nose. The unpopularity of both the prime minister and the leader of the opposition is just one piece of evidence. Numerous other events during the year contributed to this, only some of which relate to the aggressive tone of the discourse between government and opposition. The trashing of Kevin Rudd by his ministerial colleagues during his unsuccessful challenge in February was one such instance. Another was the misuse of union funds by the Labor-aligned leadership of the Health Services Union. The demonstrated sleazy behaviour of the Speaker Peter Slipper, who deserted the coalition and then finally resigned amid sexual harassment charges by a former staffer, further damaged the reputations of all parliamentarians. Federal misdemeanours have been parallelled at the state level, including in the corrupt behaviour of NSW Labor ministers revealed by the Independent Commission against Corruption. And in Queensland the LNP showed it was little better when the new Newman administration quickly became bogged down in jobs for the boys, self-interest and ministerial resignations. Second, many other traditional institutions have shared in this falling reputation, including churches, trade unions, the defence forces and the media. The Catholic Church in particular was rightfully disgraced when the Gillard government announced a Royal Commission into Child Sexual Abuse. Misbehaviour within the defence forces has led to a judicial enquiry being called into systemic sexual abuse. And the negative contribution to political debate by some media was illustrated when Sydney shock-jock Alan Jones was revealed to have told a Young Liberal audience that Gillard’s father had died of shame because of his daughter’s lies. Negative political and community reaction against him was so strong that he was disowned temporarily by his own station as advertisers withdrew their support. Third, at the state level it has been a successful year for the coalition parties. Notably, in March the Queensland Labor Government was overwhelmed by Campbell Newman’s LNP. This was the biggest of state Labor’s defeats and was followed by loss of government in the Northern Territory and a narrow victory in one of its heartlands, the ACT. Labor continues to struggle and only in Victoria has it bounced back to regain any momentum at all. Finally, in federal politics, and here I support Kelly rather than Shanahan, Labor has made something of a comeback and the dynamic between Gillard and Abbott has changed in Gillard’s favour. Before the latest Newspoll, there was some evidence in the polls that the Coalition had peaked, though it was still ahead and enters 2013 as the clear favourite to win the next federal election. Some of this comeback follows the implementation of the carbon tax at the beginning of the financial year which cleared some air for the government. But the turning point came in October as an unintended consequence of the Slipper and Jones affairs. 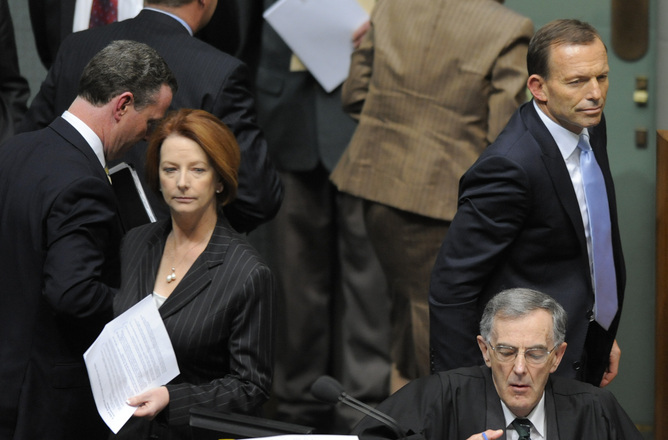 As the government defended Slipper’s right to due process and Abbott appeared to echo Jones’ reference to dying of shame, Gillard delivered a fiery attack on Abbott, accusing him of misogyny and sexism. She was initially criticised by the Canberra press gallery journalists for defending Slipper, but as the speech went viral online around the world the first judgements were reversed and Gillard emerged, if not triumphant, at least ahead. Abbott’s confidence was dented and sexism and politics re-emerged as a big topic. Later in the year this led to Abbott’s deputy being given the responsibility to charge Gillard with professional misconduct in the so-called AWU slush-fund affair twenty years earlier. The year’s losers have not only been the politicians and the political parties, but equally many other traditional community institutions. After the year we’ve had, there’s no reason to be smug. John Warhurst does not work for, consult to, own shares in or receive funding from any company or organisation that would benefit from this article, and has no relevant affiliations. This article was originally published at The Conversation and we thank them for permission to republish.